On October 15 at the Mashtots Matenadaran was opened the exhibition of works of prominent artists Iranian-Armenian father and son: photographer Antoine Khan Sevruguin (1851-1933) and his son, painter Andre (Darvish) Sevrugian (1896-1997). The heading of exhibition is “Meeting of Cultures at the Matenadaran”. 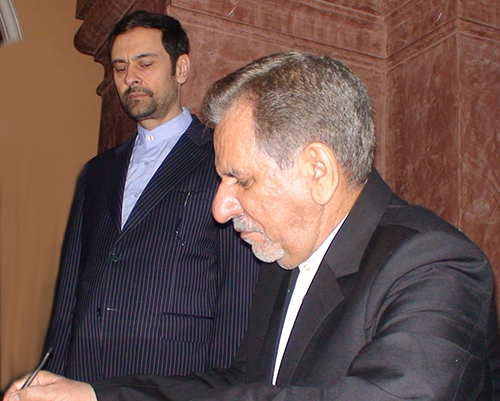 Eshagh Jahangiri, First Vice President of Islamic Republic of Iran, during his two-day official visit to Armenia visited the Matenadaran and attended the opening ceremony of exhibition, shared his impressions, and also wrote notes in impressions book of the Matenadaran’s famous visitors. Antoine Khan Sevruguin and his son, painter Andre (Darvish) Sevrugian’s more than 100 works were donated to Matenadaran in 2014 by Andre’s son Emmanuel Sevrugian living in Germany. Through this exhibition of two generations’ works is presented the Armenian-Iranian strong cultural cooperation.